Today we break up for the summer holidays. I am going home for summer of MEAT, BURGERS and DRINKS. There are no school lunches today but NAYK makes me cake at the end of a term if I have had no yellow slips. You get yellow slips if you cannot behave in a class and have to be sent out. 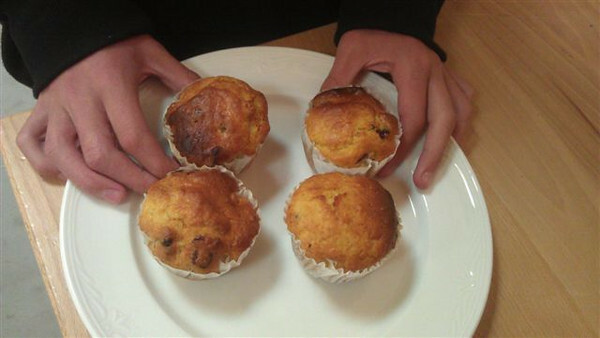 I got cranberry and orange muffins. Have a great summer thank you for having me. VEG here Thanks NAH. I hope you enjoyed your cakes. I have been very excited all day because I wanted to show you this picture of our Mary's Meals kitchen being built in Malawi. It is at the school in Lirangwe. It's brilliant that building has started. I can't wait to see it up and cooking. The kids will love it. There will be a sign 'Friends of NeverSeconds'. I will take a photo of the children with the kitchen. I hope it gets finished before the rainy season comes. Sheila and Rich from the radio sent me their rating of my soup. I made it from things we grow in the polytunnel. They liked it! Courses- main but we had amazing beetroot cakes too. There is a photo of the polytunnel and details of the radio programme here. I have been sent lots of really nice lunches with 10/10 scores and I think you should all nominate them for this award. If they win you might get seconds! Thanks to the Steiner School in Hereford for being this week's guests. Schools all over the world are on holiday at the moment and so we're visiting Texas Tech, USA, to experience some University food. Please keep sending your pics in and also if you'd like to guest blog let me know! It might be you blogging week after next! Wow! That's amazing that they've already started building the kitchen. Congrats to Veg, Veg's family, and everyone who donated to the cause! I look forward to seeing what the kitchen looks like when it's finished. The BBC Radio 4 Food Programme is available as a Podcast which can sometimes be easier for people outside the UK than iPlayer or Listen Again. You can subscribe on this page so a link will be sent to you for the Podcast once it is available. Don't forget to unsubscribe afterwards if you don't want further ones though it is a good programme. Thanks for that, JMB! I didn't actually subscribe, but I've bookmarked the page and I'll be checking it frequently. Also made it to Radio 4 Today morning news. 8.40am tomorrow (Saturday). Thrilled to see the foundation for the school is already being built!! NAH and NATK, thank you for your blog this week, is has been a pleasure to read. NAH, have a great summer and be careful if you go dragon hunting again. Have a great weekend all and looking forward to Texas next week and the radio show. Thats cool. Where do the bricks come from? (i.e., is there a brickworks nearby or do they have to ship them in and increase building costs. My daughter (Auryn - like in the book) would like to know what beetroot cakes are? VEG has a notebook and she's jotting down questions to take to Malawi so she'll try and find out. Wow...just looked at the recipe for the beetroot cakes. Some of the ingredients are things I've never heard of in the USA. I'm going to look them up and see if there are equivalents. This is what I love about this blog...the sharing of cultures. And major congrats on seeing the kitchen actually being built. That is soooo amazing. I wish everybody could see what can be done for so little if we all pull together in some small way. DogsDon'tPurr, those seemingly unusual ingredients are (mostly) just English names for things readily available at American grocery stores. You can make your own caster sugar (if you can't find superfine sugar in your local market) just by whizzing regular white sugar either in a food processor or a very clean coffee grinder until it's very fine. That, of course, leaves the "golden" out of the equation though, doesn't it? The "golden" in golden caster sugar comes from the fact that it is slightly less refined/has a bit of molasses left in it. However, the difference between regular caster sugar and golden caster sugar is like the difference between white sugar and raw sugar (in other words, barely discernible once it's mixed in a recipe). It is not at all like the difference between white sugar and brown sugar. If you really want to be a stickler about it, you could whiz some raw turbinado sugar in a food processor or coffee grinder. http://www.allotment.org.uk/recipes/cakes-baking/beetroot for those who couldn't copy&paste the link (like me). 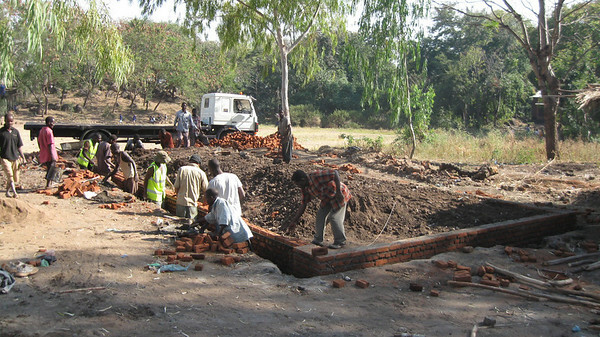 What a great picture of the building of the new kitchen in Lirangwe! A photo diary of the work as it grows will be amazing. I am looking forward to the NeverSeconds programme on BBC Radio 4 on Sunday lunchtime. Congratulations VEG on everything! You are one amazing little lady! Those muffins look delicious, I hope NAH liked them and NAYK enjoyed baking them! I've just been listening to the Food Programme (my usual Radio 4 listening on a Sunday lunch time!). You all came over brilliantly and I hope it means that even more people will visit the blog and think about what's served up to children in school lunches. How exciting to see the kitchen's foundations already laid in Malawi and the walls going up, fingers crossed for a swift completion before the rains come! VEG... You should be so proud of what you've accomplished! You're a remarkable young lady. I'm just amazed by what you're doing. The impact of your efforts are what life is all about. You've inspired millions of people with your compassion and I personally feel so lucky to have found your blog! The world needs more people like you, sweetie. I'm just speechless... If you ever get to California I would be honored to meet someone like you! To VEG's Dad and family... you have a very special daughter. You must be so proud! Congratulations on raising such a wonderful child. 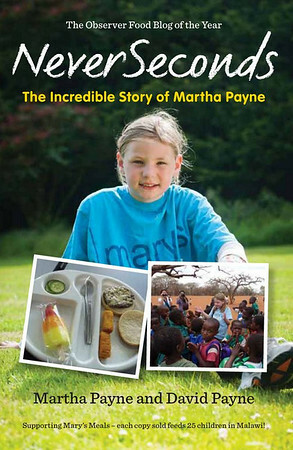 Thank you for allowing her to change the lives of hundreds of children in Africa. Amazing! To Veg and family, heard the programme on Radio 4 , loved you all and it was interesting to listen to, keep up the good work! NAH - those looked like yummy cakes! Enjoy your summer of meat/burgers/drinks. We're very glad to have 'met' you through this blog. I work at a UK university, so I'm looking forward to hearing about US uni food this next week. Thank you NAH and NAYK! Have a great summer! Now let's see if we Americans can hold up to the bar that VEG has set so far!